Absolutely superb pin up of Hammerstein and Ro-Jaws, the stars of RoBusters ( and later ABC Warriors! ) They were created by Pat Mills and Kevin O'Neill as 2000ad's answer to C3P0 and R2D2. This pin up was created for the Society of Strip Illustrators 1978 'yearbook', where members would contribute examples of their work. The SSI acted as an informal union attempting to work for better rates, return of original art, and even credits for the illustrators in the books/comics that they worked on. 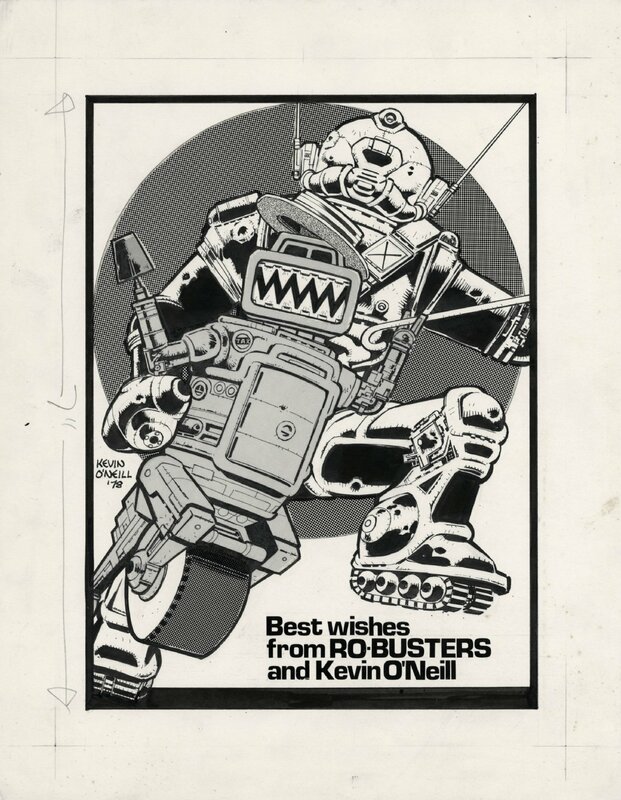 This is a very early and rare piece of Kevin's art, as he helped define the look of so many major characters in 2000ad. Art is in fine condition, on card, 27 X 34 cm.